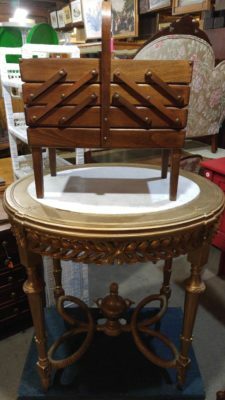 While we don’t have time to take and post pictures of the dozens of new pieces that arrive every week, we will attempt to give a quick weekly update on some of the new arrivals, and include a picture or two of our favorite pieces of the week. 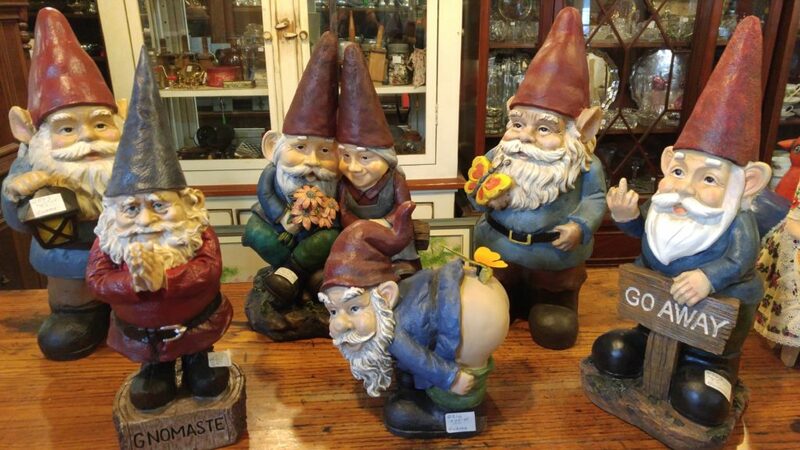 If you want to see all the new arrivals you’ll just have to pay us a visit. We are ready and well stocked for cottage season! Another batch of reclaimed wood furniture arrived from Vancouver this week. 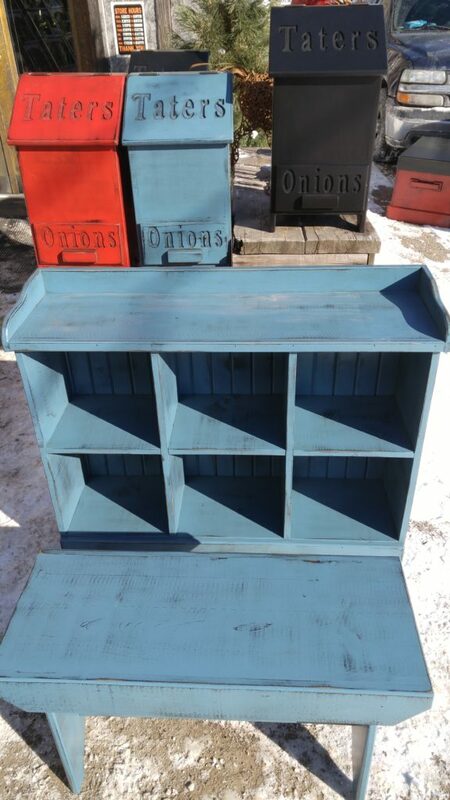 We’ve restocked: night stands, media units, chairs, coffee and end tables. Three new metal birds showed up, a photo is attached. 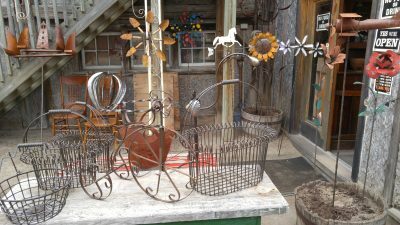 We now have 15 different metal birds in stock in case anyone else wants to create a backyard aviary, as some of our customers have already done. 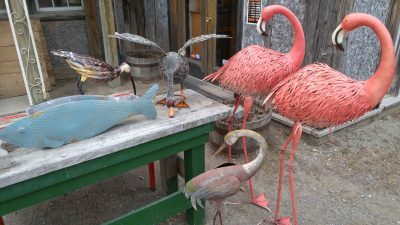 Multiples of all of the birds are available if needed to create your flock. Some of this week’s antique furniture arrivals include: oak curio cabinet, cedar chest, oak medicine cabinet, 3 pedestals including a nice French pair, inlaid parlour chair, folding plant stand, pair of wrought iron open corner shelves, 3 odd night stands, 3 panel oak privacy screen, magazine table, rolled oak sideboard, 6′ maple harvest table, Queen Ann fireside bench, cherry drop front desk, banded Duncan Phyfe dinning table, wing chair, assorted kitchen and dinning room chairs, and more. Antique odds and ends include: a 10 gallon and a 20 gallon Red Wing crock-a photo is attached, hump trunk, exceptional oak tool chest, 3 mirrors-1 is a shadow box mirror, 2 Tiffany style fireplace screens, bronze chandelier, pair of candle lamps, spice rack, copper boiler, coal bucket, brass planters, large milk can, a couple pieces of sterling hollowware, barometer, lots of cups and saucers[Imari, blue Mikado, Royal Crown Derby, Colclough, Tuscan, Shelley, Phoenix, Paragon], assorted pewter and brass pieces, and lots more. This week a shipment from Indonesia and Thailand arrived. 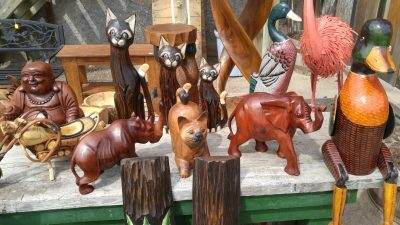 It was comprised of nature form coffee tables, canoe bookcases, and a wide variety of hand carved items including: dozens of jewelry and small boxes, 6 types of puzzle boxes, twist tables, tribal masks, boat paddles, bear side tables, bark and live edge bowls, duck puppets[yes that’s right, duck puppets], figures[elephants, cats, rhinos, motorcycles, ducks, and buddhas], blown glass and coffee wood sculptures, enormous floor standing vases, and concrete urns. 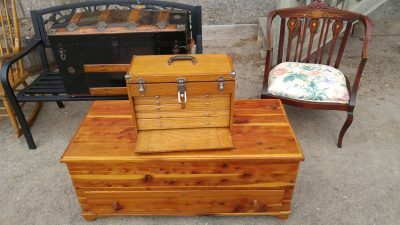 Most of these are new items for us, some photos are attached, the coffee tables are fantastic! A shipment of reclaimed wood furniture arrived from Vancouver. 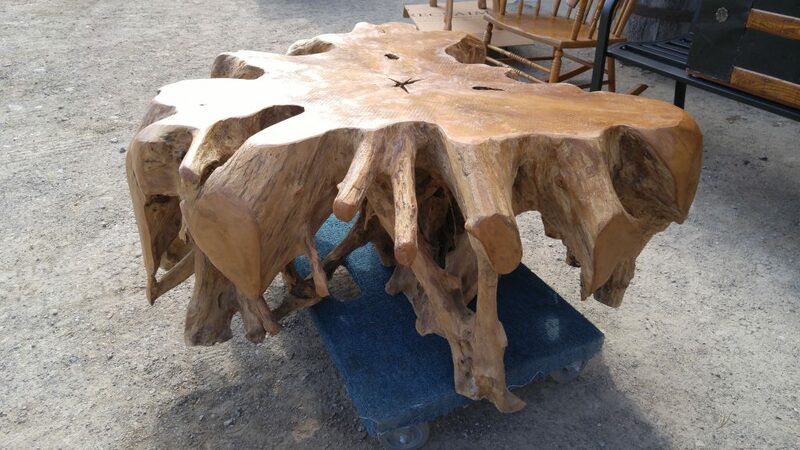 The large Irish coast coffee table is back in stock, and we’ve replenished benches, media units, and dinning tables. 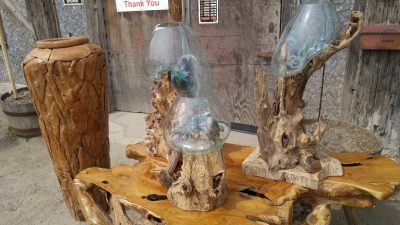 Check out our Reproductions page for more details. 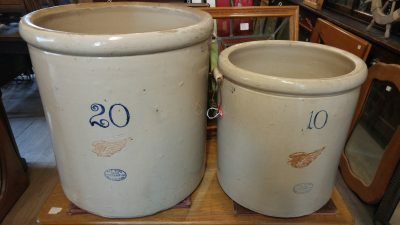 Far too many antique arrivals this week to list everything, and lots of unusual items that aren’t easy to categorize. However some of the highlights include:192 piece Royal Albert petit point dinnerware set, 9 assorted chandeliers and ceiling light fixtures, set of 3 handblown whiskey decanters, King size quilt, depression glass, transferware, Yamaha acoustic guitar with case and sheet music, shoeshine stand, 2 vintage cameras-Zeiss, large oil painting, 3 framed stained glass windows, framed print of flatiron building-Toronto, 2 nice unusual vices, cool wall hanging tool cabinet, nice walnut Chippendale half secretary desk, mahogany and walnut sideboards, unusual fireplace poker set, carved pedestal, all kinds of tables, chalk paint Queen bed, lots of lamps, 4′ steel and glass sofa table, pair of early French night stands, a few primitive pieces, planters, and an outdoor bench in time for spring. 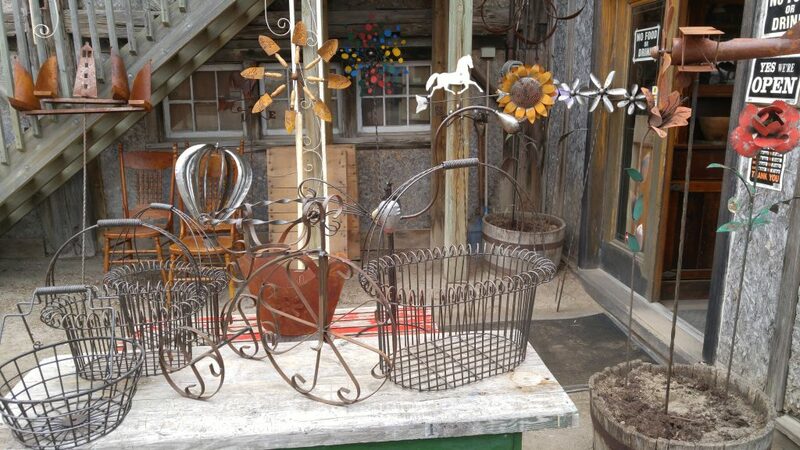 The parade of new spring outdoor items continued this week with: 8 different types of kinetic wind spinners [some intentionally rusted, some not], horse and rooster weather vanes, tricycle planters, egg and crab baskets, 4 types of flower stakes, handbag planters, basket trees, wind activated dancing birds and hot air ballons, wall fish planters, red or white steel sofa gliders, 2 seater porch swing, and more. 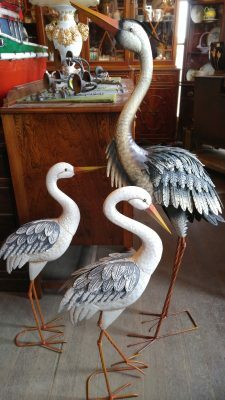 The more includes some new metal birds: sandpipers, geese, giant pink flamingos, and some multicoloured birds [we aren’t sure what kind of birds they are]. 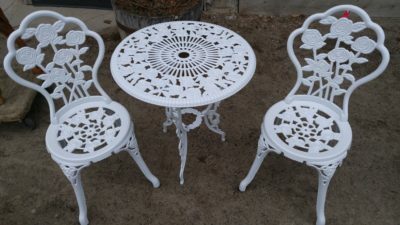 A couple of photos of some of the outdoor items are attached. 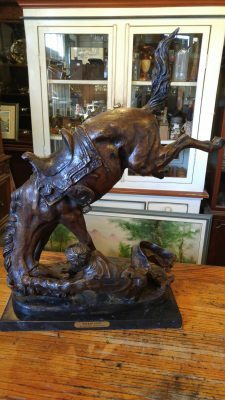 Two rare bronze pieces came in this week, a 25” Frederic Remington titled “Wicked Pony”, and a bronze plaque “Built by the Northey MFG Co. Engineers, Toronto, Ont.”. Some of this weeks antique arrivals include: an enormous 49” x 72” framed mirror, a cool steel sculpture of an outdoor scene, rocking horse, spooled crib, silver chest, assorted planters, assorted chairs, snow shoes, featherweight sewing machine, rug beater, maple magazine table, 2 washboards, assorted sterling silver pieces, a lot of cups and saucers, 2 fireplace poker sets, 2 child’s rockers, press back highchair, a lot of 14 paperweights, electric advertising sign, giant retro china cabinet, assorted smalls, and more. Spring has arrived as have more outdoor spring arrivals including: a collection of garden gnomes-a photo is attached, benches, bistro sets-a photo is attached, cool hummingbird and butterfly floral glass plant tables, a charming rustic fountain, and of course the large bobblehead garden gnomes that were a big hit last spring. Warning! The bobbleheads have been discontinued unfortunately, so this will be the last batch. 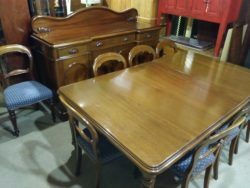 Some of this week’s antique arrivals include: a terrific Victorian burled walnut games table, a collection of leather bound books [mostly classics and collections of poems], half moon hall table, pine night stand, large peanut basket, 3′ x 5′ pine harvest table, country bonnet chest, wine barrel, chimenea, French occasional chair, 2 outdoor folding chairs, Victorian mahogany chest of drawers, 2 bowling balls, tall cube bookcase, parlour table, assorted lamps, nice large ornate gilt mirror, miscellaneous smalls, and more. 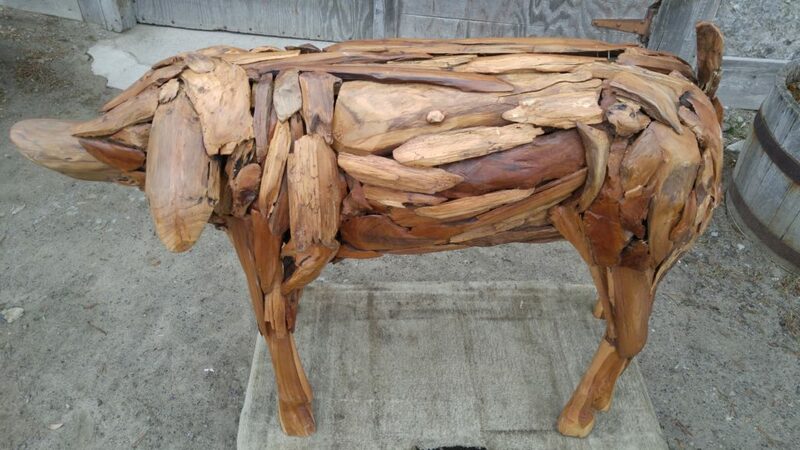 The most unusual items of the week are large [44” long x 30” high], teak indoor/outdoor pigs. 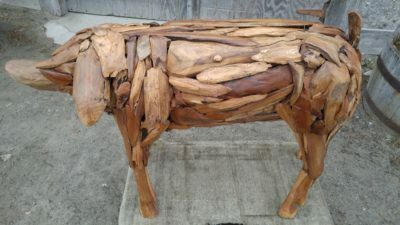 A photo is attached of one of the pigs. If you are in need of a collection of teak pigs, and who isn’t, we have more. 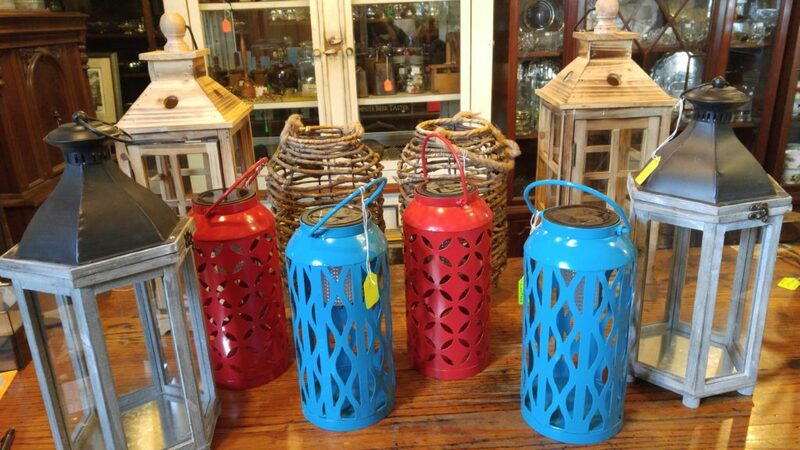 New spring outdoor items arrived this week, and there will be new outdoor arrivals every week until the end of April. 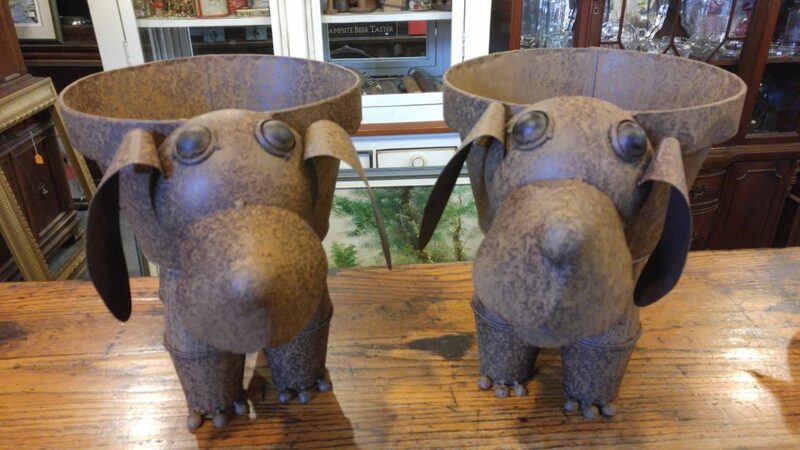 Whimsical metal outdoor planters arrived. A photo of a couple of the dog planters is attached, elephants and trains are also available. 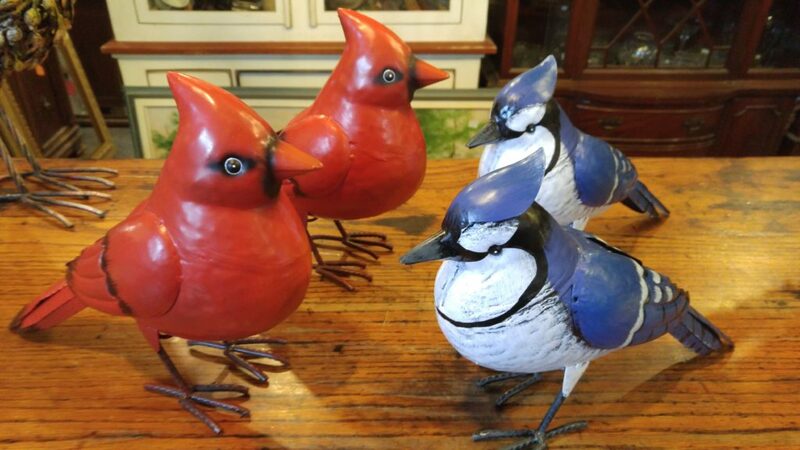 After a long wait the very popular metal blue jays and cardinals are back, a photo is attached, and they brought some of their peacock and owl friends with them. 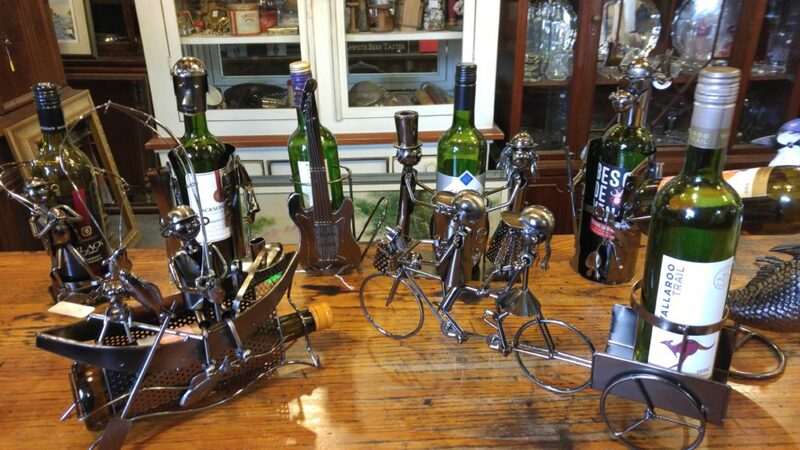 Another long awaited new batch of wine bottle figures showed up, a photo is attached of a few of them. Mostly new ones, and a few old favorites including: 4 fishing related, motorcycle, tandem bicycle, barbecue chef, guitar, and of course the moose skier. Reproduction hall trees and paintings also came in. Some of this week’s antique arrivals included: quarter cut oak drop front desk, pine dresser, marble top plant stand, oval parlour table, walnut secretary desk, 19th century pine kitchen table, Gibbard drop leaf table, assorted living room and dinning room chairs, storage ottoman, King poster headboard, pair of Gibbard night stands, 2 funky art glass vases, assorted mirrors, nice double oak plate rail, 3 different lots of cups and saucers, large Tiffany style dragonfly lamp, large Tiffany style floor lamp, oak fire guard, 2 globes of the world, 2 spotlights, Herend luncheon set, pool cues, and more. The rarest item of the week is a 100 year old Hungarian nursing doll in mint condition. A shipment of reclaimed wood furniture arrived from Vancouver this week. 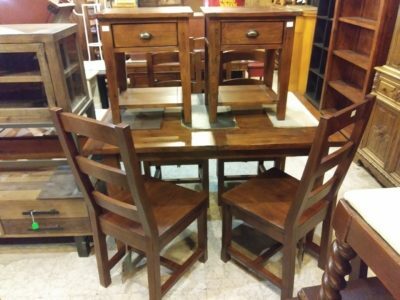 We’ve restocked: dinning tables, chairs, large bookcases, and lamp tables-a photo is attached. Check out our Reproductions page for more details. Two cool large signs showed up-a photo is attached. 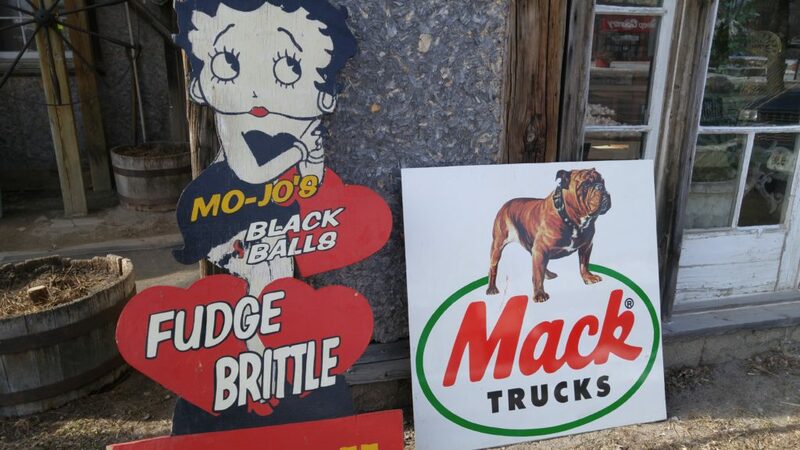 The Betty Boop, “Mo-jo’s black balls fudge brittle candy” sign is going to make quite a conversation piece. If you are a regular reader of this page you’ve seen “smalls” written before. 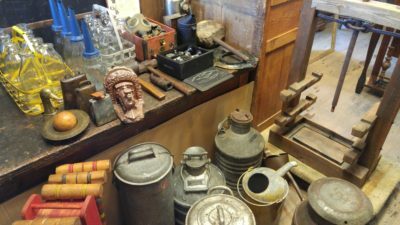 In the Antique world smalls refers to a wide variety of items, pretty much anything that will fit in a box. 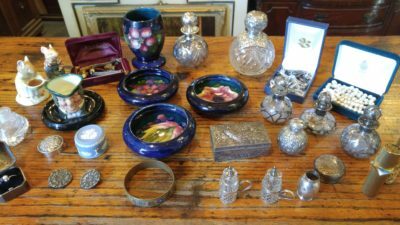 Lots of great and unusual smalls arrived this week including: a miniature ship in a bottle, flatware sets, onyx powder dish, hand woven cigar holder, oak ring box, figurines, cups and saucers, some nice assorted china pieces, 2 china sets[Noritake and Edelstein Bavaria], assorted large crystal pieces[vases, bowls, pitcher], oil lamps, bull horns, Champion spark plug fiberoptic sign, Harley Davidson dartboard, 2 small window mirrors, hand carved wooden Quebec scene, 2 small crates, and lots more. Some non “smalls” new arrivals include: a grandfather clock, octagon wall clock, large brass summer screen, walnut drum table, Duncan Phyfe drop leaf table, rolled oak buffet, fern stand, French Victorian chair, assorted dinning room chairs, oval parlour table, wall mount mantle, nursing rocker, 4 trunks, leaded window, nest of tables, unusual curio cabinet, an electrified hanging oil lamp, and lots more. This week an exceptional solid mahogany Victorian dinning room set arrived, a photo is attached. 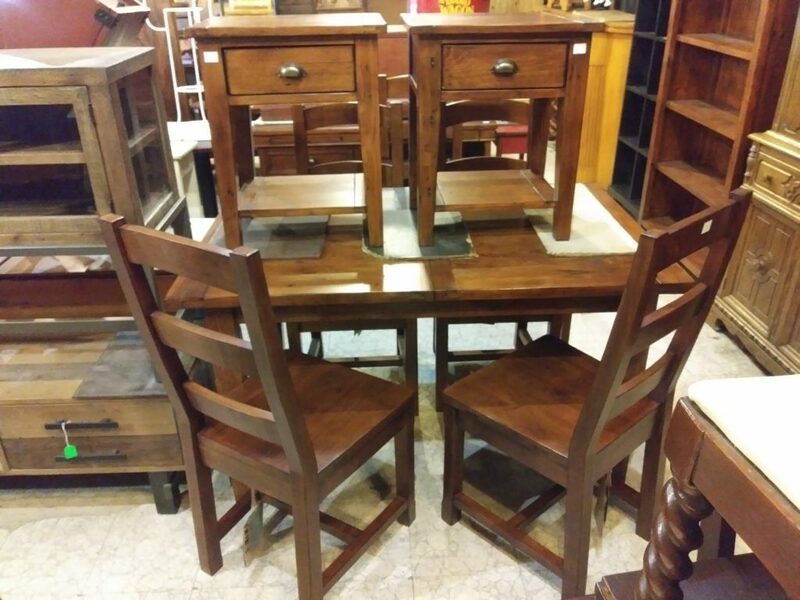 The set includes: table [48”wide and will extend to 100” long with 3 leaves], sideboard, and 8 balloon back chairs. 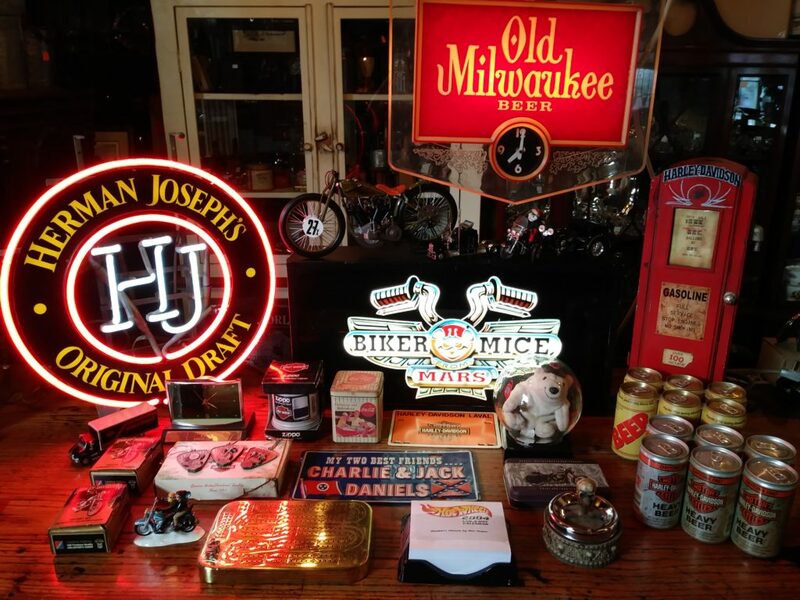 We also got in a collection of collectibles: mostly Harley Davidson items with a few beer sings, Jack Daniels, and Coca Cola items. New antique furniture arrivals include: rolled oak 2 door sideboard, white wicker porch chair, Empire arm chair, French provincial living room arm chair, outdoor 48” round table with thick bevelled glass top, French tea table, oak parlour table, magazine stand, Victorian lamp table, oval French provincial lamp table, solid mahogany silver chest with flip top, Deilcraft corner shelves, assorted odd chairs, and more. 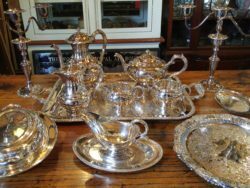 A lot of super shinny silver plate hollowware showed up including a nice tea set, and a pair of candelabras-a photo is attached. A few odds and ends include: 3 Tiffany style lamp shades, a large framed needlepoint, cups and saucers [Aynsley, Coalport, and Royal Albert], a nice Asian chess set, small gas heater, and a Meissen tea set comprised of 14 cups and saucers, cream and sugar, and large tea pot. 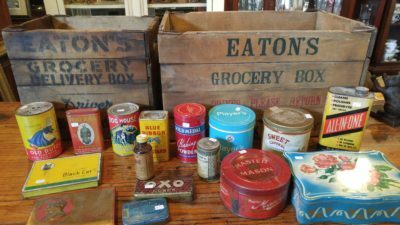 This week we brought in a collection of Eaton’s items including: 2 sizes of folding wooden grocery crates, hat boxes, tins, mason jars, and apothecary bottles. Believe it or not, it has already been 20 years since Eaton’s went bankrupt. We also got in a collection of assorted vintage tins and antique bottles. The tins are becoming more and more collectable, the hipsters keep asking for them. 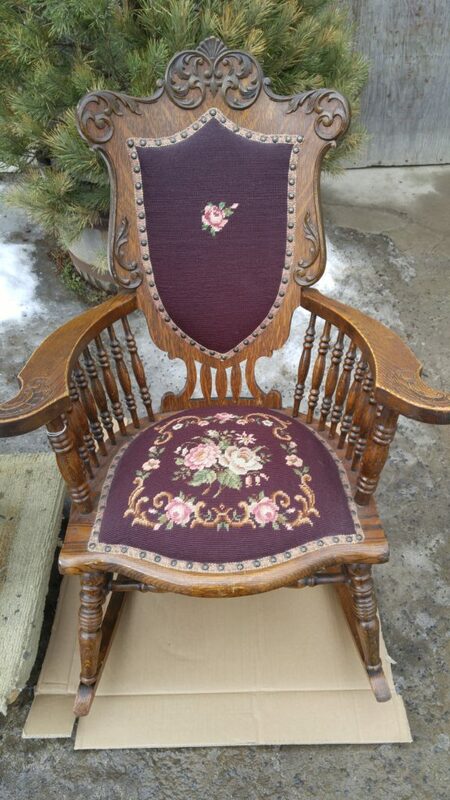 One of the best needlepoint rocking chairs we have ever seen came in this week, a photo is attached. Lots of wall art arrived: paintings including “Autumn in Quebec” by John Beynon, watercolours, prints, and assorted empty frames. 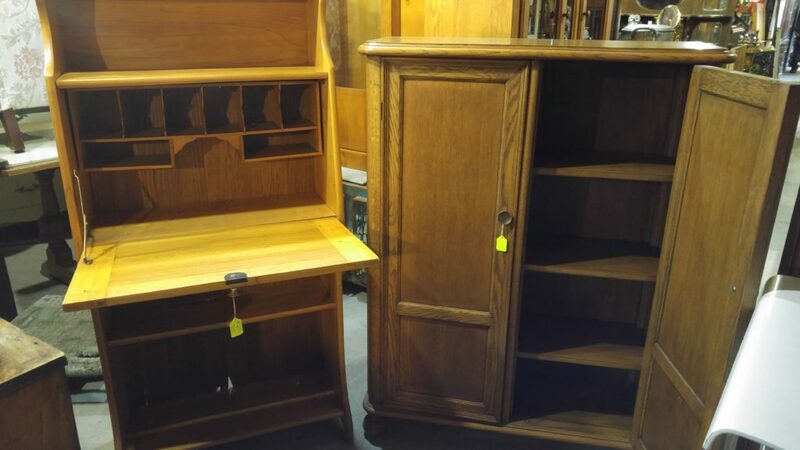 An assortment of mahogany furniture turned up including: a fireplace mantle, pair of night stands, chest on chest, dresser with mirror, 2 door server, and a small china cabinet. Some odds and ends new arrivals include: an unusual 6′ tall multi level iron and wood plant stand, primitive kitchen utensils, carpet runner, small modern curio cabinet, 1939 Coca cola silhouette girl thermometer sign, and more. Our favorite item of the week was an angry owl weather vane, a photo is attached. 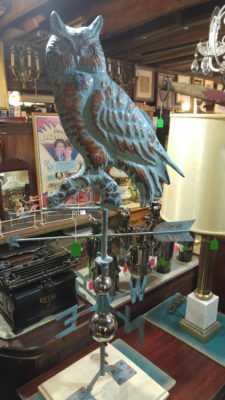 The owl’s expression is priceless, the weather vane is not. This week a couple of old favorites are back, the cast iron cat book ends and cast iron sets of keys. 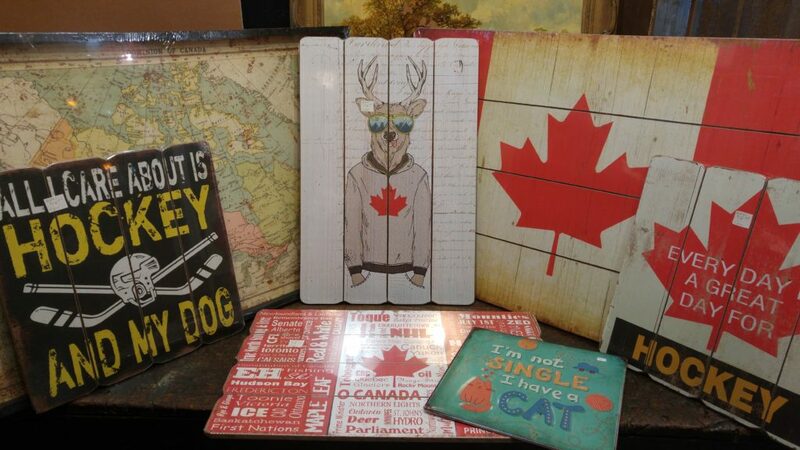 We also have a new collection of Canadiana themed signs-a photo is attached. A collection of vintage hats came in, some with hat boxes-a photo is attached. Antique furniture arrivals this week include: walnut cedar chest, primitive dovetailed pine blanket box, primitive lowboy dresser, hall tree, rustic jam cupboard, assorted stools, Larkin’s desk, blind front oak 2 door bookcase in excellent condition, folding server, Victorian parlour table, candle stand, cane rocking chair, 20 assorted primitive chairs, and more. Some odds and ends from this week include: printers tray, cheese box, potato seeder, pair of miniature chimeneas, unusual iron wall sconce, tricycle planter, oak octagon kitchen wall clock, confectionary scale, leaded mirror door, assorted lamps, large copper planter, chunky brass fender, Royal manual typewriter, 2 art glass style vases, kerosene pot belly stove, and more. We would like to salute our customers on their resiliency, the weather has been particularly brutal lately and customers keep showing up. It is appreciated, winter will end! 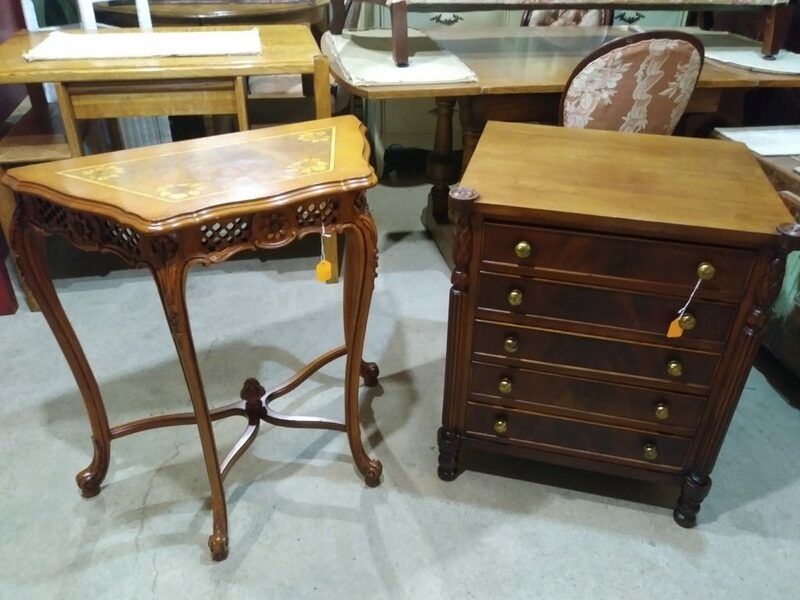 Lots and lots of great occasional furniture came in this week including: Louis XV inlaid hall table and lamp table-not matching, Duncan Phyfe nest of tables, a really cool walnut muffin stand, mahogany bachelor’s chest, 5 drawer silver chest that looks like a bachelor’s chest, inlaid vitrine, 3 drawer French night stand, walnut magazine table, spooled corner whatnot, oval marble top table, a nice mahogany parlour table, oval and round lamp tables, pair of rush seat chairs, pair of faux bamboo vintage Regency chairs, Fruitwood Canterbury magazine rack by Baker, Louis XVI settee, and more. 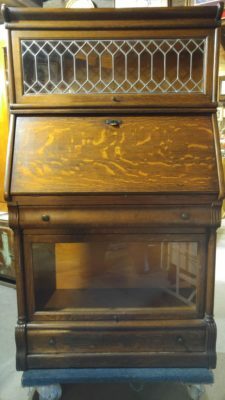 Two different 360 degree curio cabinets arrived, one round mahogany, the other octagon and painted silver. 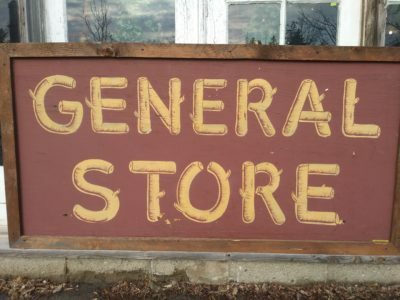 A photo is attached of a 3′ x 6′ general store sign, we rarely get signs this large. 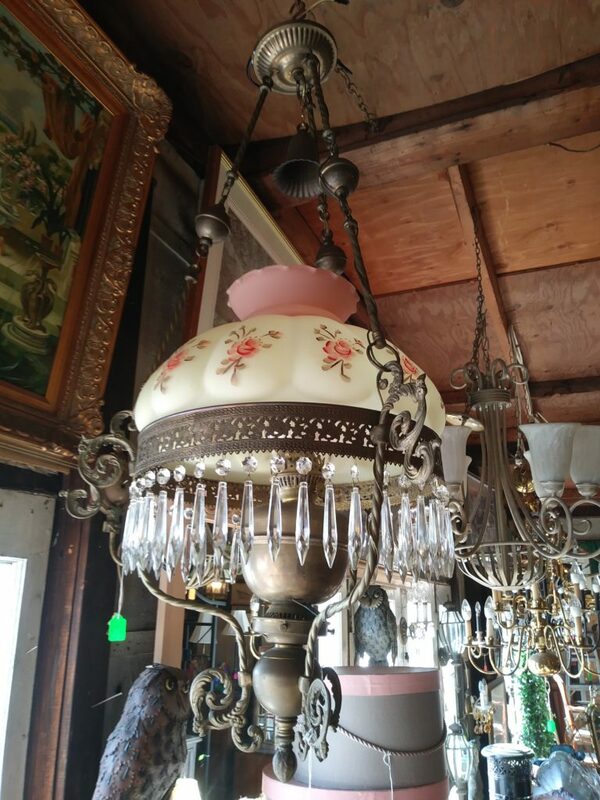 Lots of lamps showed up including a pair of Cloisonné style table lamps. Some odds and ends include: inlaid shaving mirror, folding sewing cabinet, chrome and marble floor lamp, 2 large porcelain vases, table top weigh scale, Victrola, poker set, cast iron pots, multiple thread winder, assorted mirrors, a couple of nice gilt frames, and a couple of nice paintings in gilt frames, assorted sterling and plated silver, 4 Murano glass style figures, 92 piece Bavaria set of china, 43 piece Coalport-Pageant set of china, and more. 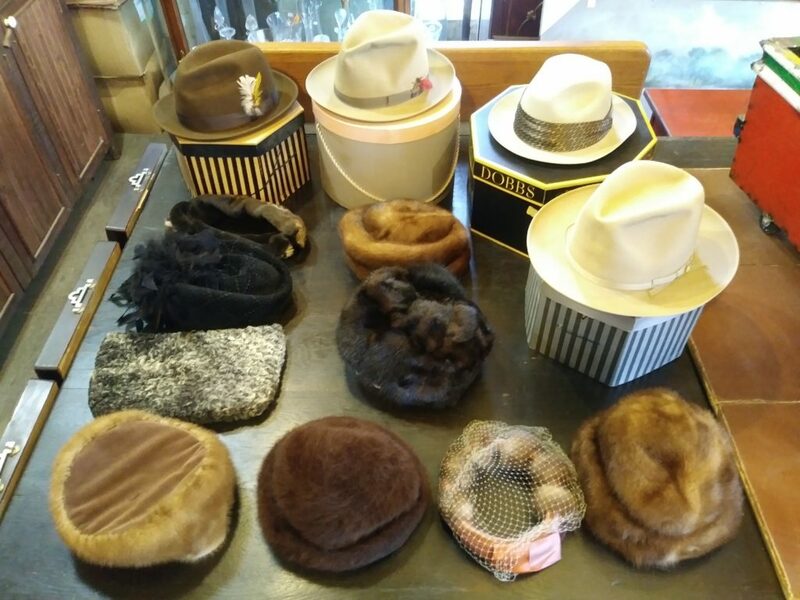 This week we received an extremely colourful shipment from Springwater, Ontario. A photo is attached of a few confederation over black pieces, it’s our most popular colour lately. Check out our Reproductions page for more photos. 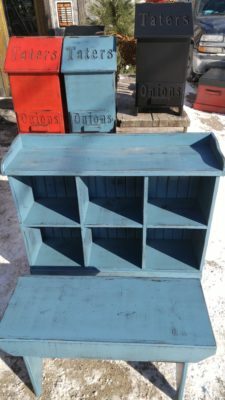 Springwater arrivals include: tall sideboards, tater bins, ladder shelves, clipper trunks, bucket benches, milk benches, plank shelves, and assorted cubbies. Some items we have in stock in as many as six colours, all Springwater items can be ordered in 30+ different colour combinations. 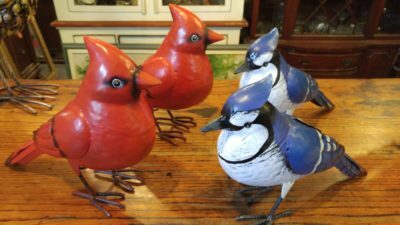 Metal indoor/outdoor birds have become a hugely popular item for us, there are three batches coming for spring. 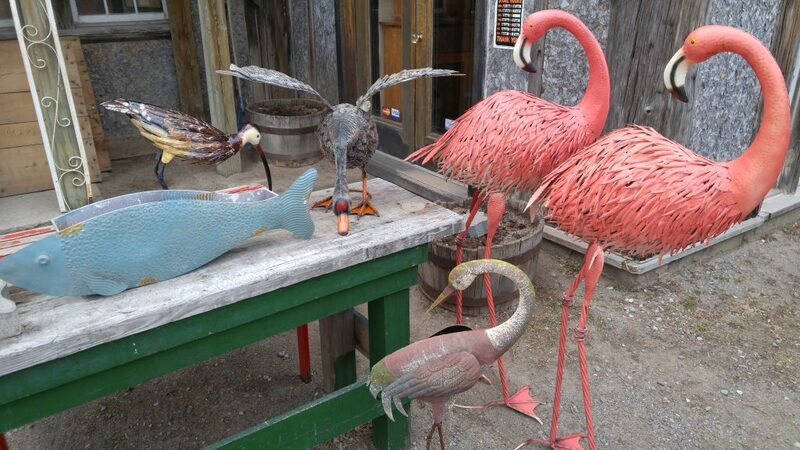 The first batch showed up early and included: 3 types of post mounted owls, roosters, parrots, flamingos, and peacocks. 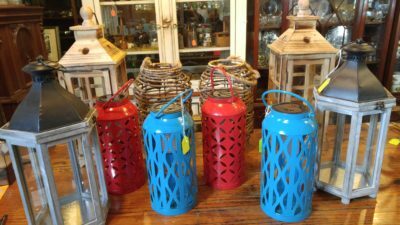 A new line of lanterns arrived with the birds-a photo is attached. 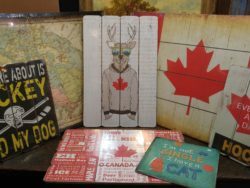 More reproduction arrivals include: ship’s wheels, folding plant stands, and framed maps of the world. 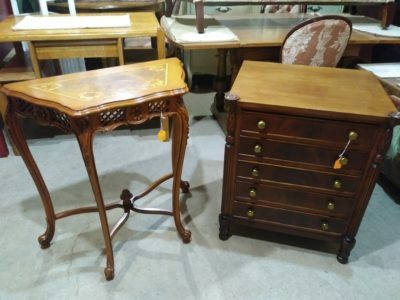 Some of this weeks antique arrivals included: an oak sideboard with mirror, small oak carved corner cabinet, onyx cigarette box, 3 Dresden porcelain calling card trays, 2 nice mahogany mirrors-1 oval, porcelain umbrella stand, floor lamps, walnut umbrella stand, assorted silver, and lots more. This week’s most unusual item[s] is the first lot from a very unusual collection- a photo is a attached. Bee smoker, Parker beading tools, large hay rake, milk and oil cans, gas and anti-freeze cans, ammonia gas mask, croquet set, torch tools, butter churn, and a 17th century wine/juice press are a few of the items. Every once in a while a terrific rare piece comes in that needs a lot of work. Often in the winter you will see someone by the fire working on such a piece. 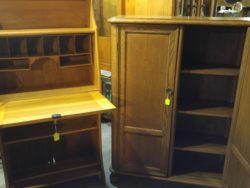 A photo is attached of an oak Arts and Crafts stacking bookcase/desk combo, it was a mess when it came in, but it turned out great. 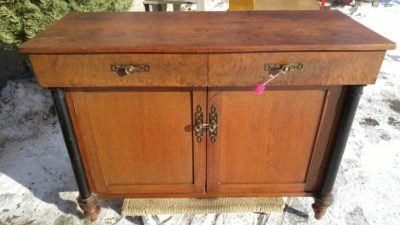 Its the kind of piece we only come across every couple of years, so it was worth all the time we put into it. 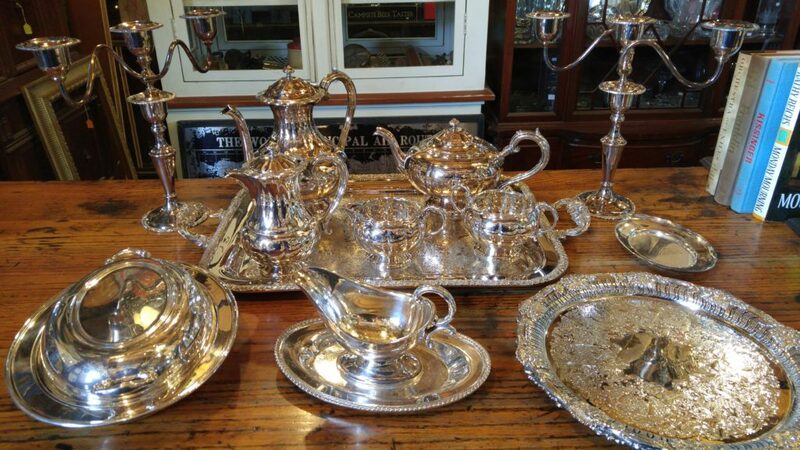 Lots of great china arrived this week including: an enormous quantity of cups and saucers, 84 piece Minton set-12 of everything, 59 piece Coalport Indian tree set, 49 piece H & K Tunstall set, Royal Doulton figurines, Wedgwood pill box, Parson Brown Royal Doulton ash tray, Nippon demitasse set, and some odd pieces. More arrivals include: a bunch of table lamps, 3 Moorcroft pin dishes, an assortment of crystal and sterling perfume bottles and scent testers, small jewelry box, collection of 7 lighters-3 Zippo, 2 wooden ladders, assorted gold, sterling and costume jewelry-not something we usually get, a cool rustic Asian hall table, Empire sideboard, Art Nouveau umbrella stand, unusual 19th century Art Nouveau bronze 6 light chandelier, rustic kitchen table, a lot of sterling silver flatware including a set for eight, assorted silver plate flatware and hollowware-which has been extremely popular lately, maybe its back in, and lots more.